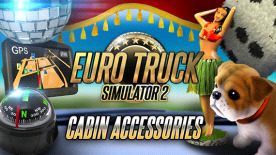 This product requires the base game Euro Truck Simulator 2. Decorate the interior of your truck cabin with practical as well as totally impractical accessories and toys! Includes a sat nav unit and a ball compass on the functional side, and a host of useless junk that that can help you turn your cabin into a comfortable den to spend your long days and nights in. Just remember not to overdo the decoration, obscuring your view may be frowned upon by the police in real life. A thick row of little flags or mini-scarfs dangling from suction cups on the windshield may be a part of trucker culture, but it is more appropriate for a tuning truck show rather than for everyday use on the highway.